This is a summary for Brinley’s 49th week; she was 48 weeks old. It’s the final countdown! I wanted to make something clear based on a question I got. Last time, I told you how she dropped the last feeding. She stopped nursing that feeding, but I still gave her a bottle of milk. As I drop nursings, I always replace with milk (assuming the child will take milk–which McKenna wouldn’t until she was a three year old). Good news, no biting this week. Bad news, Brinley really would not eat for her third feeding. Now, I am at the point I want to drop a feeding a week if she is interested in doing so (which she obviously is), but I think that dropping the 3rd and 4th feedings is a bad idea. So far, she is still nursing for the first two, though, so it is working at this point. I think her reason for dropping this one is being interested in what the family is doing since everyone is home when she is eating this one. Brinley is starting to refuse purees with anyone other than me. She will eat them for me but no one else. She is starting to show preference for finger foods–or foods in “real” form. We had a disruption come up this week; Brinley started to stand in her crib! Here is the crazy thing: I taught her how! I don’t know why. As I did it, I thought, “This is probably dumb of me.” My husband thought I was crazy. Well, here’s the thing. She is going to learn at some point anyway. The day will come. I guess I was just feeling up for dealing with the disruption. So I taught her. And in the end, it was only an issue before one nap. She quickly figured out how to get down on her own. She was so, so happy this week! It was so great after our grumpy teething weeks. I was so glad to have my happy girl back. She is just really expanding her gross motor skills like crazy right now. It is a big focus of hers. 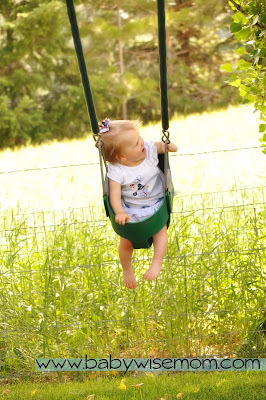 Brinley loves to be outside and loves to swing. She also loves animals. She loves attention and therefore really likes the elderly. They are the best attention givers in general. She had another day with Nana this week. This time, my dad was home for the day, too. He took it upon himself to teach her to say, “aahhh!” every time she took a drink. He finds it incredibly amusing. And so she does it. 7:30–feed, then bedtime. In bed by 8:00-8:30. I find it amazing how fast a baby can learn and think this is a strong testament to what you can teach a baby if you put some time, effort, and positive reinforcement into the training. She does it when she drinks and whens he sees anyone else drink. She also does it when she wants a drink. AND she did it at a tea party I took my girls to, you know, one where the focus was on learning good manners. Nice Brinley. Thanks, Dad. Glad to hear my daughter isn't the only one refusing to nurse! My daughter(1 week younger than Brinley) dropped to just 2 nursings of her own will a couple weeks ago and my milk supply really tanked. She only wanted to nurse morning and night. I basically dried up. So, she started getting formula morning and night(lasted until 2 days ago), but now refuses that. So, I guess we are done. I wasn't sure if I should try milk, but will do since I see you've done it! Oh yeah, and my daughter has had the major grumpies with teething too! She has 1 molar now and another that I can see, but isn't through yet. She was very fussy about other teeth, but these molars are real bad for her!! Good morning, I'm sorry for posting this on a thread that isn't the same topic, but I couldn't find what I was looking for elsewhere.My baby is five months old yesterday, and has been having sleep issues for about two weeks. She is teething for sure, we also started solids but she doesn't eat much so I don't know if they are helping or not. Until two days ago her nighttime sleep was still perfect, sleeping from 7:30 until 7 am. Her naps, however have been horrible. We had been on a four hour schedule prior to these issues, and it was working perfectly for about a week. But now it's completely Blown out of the water. She was also staying awake for a solid 1.5 hours. All of a sudden she yawns from the minute I get her from her nap and all the way through feeding, play, even rubbing her eyes. S I tried shortening her wake time to an hour. And she'll lay down, grab her love, s Ickes her thumb and roll over as if she's already asleep, but then she'll get active in about two minutes! And then no nap. She almost never goes to sleep. Sooo, I tried keeping her up longer for a few cycles, just under two hours, but they same thing happens.Basically she takes a super long time to fall asleep, then wakes early from her naps. She's happy when she's up and never shows crankiness so I am at a loss. Any ideas? Kristen, I always start by trying to figure out what has changed since things went from "good" to "bad." A good thing to consider is sickness. Could she have an ear infection or some other sickness?Could the teeth pain be waking her? Are you doing any sort of pain relief there?If not teeth pain or sickness, then…Her waketime length is probably not perfect for her. Have there been any other changes that could be contributing to the sleep going downhill? Not really, the only thing I added was two solids, avocado and sweet potato. It's really confusing because today, she finally took a 2.5 hour nap and woke at 3:30. We tried for her fourth nap, knowing it would be short, and I put her down at 4:45, right when she started getting quiet and it appeared as though she was on her way to sleep. But she never slept and just spent the time on all hands and knees rocking and talking. So I just got her at 5:45 and started the bed routine. By the time I snapped her pjs closed she had started sucking her thumb which is usually one of her signs, and when I put her into the crib she literally grabbed her doll and rolled over. She was asleep in seconds! so it does seem like her wake time needs tweaking but her cues during the day are so inconsistent that I try to follow the clock, the most recent timing we have done is 1 hr 15 min. Sometimes this works sometimes it doesn't. Do you think she's not getting enough awake time? She's five months old but was two weeks late, and mentally she's fitting with the age of 5 months 2 weeks, with the wonder weeks book. Maybe I need to keep her up longer and stimulate more?I just have a hard time believing that she needs to be up longer than 1.5 hours, as much as I would prefer that! Is it possible she could or should do two hours? She has no problem going down for bed and sleeps immediately hitting the mattress. Just recently she's started waking at 6 again, so….I don't know. Sorry, not fourth nap I meant third nap. She does three naps per day. I think I might have at least part of the problem…this morning she was up for an hour and ten minutes, then suddenly laid her head down and sucked her thumb, so I whisked her ff to the crib. But, on ten way there she started rooting, and opening her mouth wide,what she does when she's hungry. Since I didn't want to let her cry it out if there was a chance she was in fact hungry I tried nursing and sure enough she nursed like she hadn't eaten anything. So I'm not sure if its a supply issue or needing more? We nursed both sides fully th is morning when first waking, plus she ate about one ounce of sweet potato before refusing anymore. I mean she seemed content. But apparently wasn't? When bottle fed expressed milk she eats about ten to twelve ounces at a time, sometimes just eight, but it's usually a lot. Do you think it's time that I stop nursing and switch to bottles so I can track her intake? The problem is that she isn't up to eating the 2 1/2 oz of solids as suggested by the book because she refuses it after a while.If its a supply issue, it would explain the decrease of napping ability for the past few weeks. Maybe it's the teething and it hurts? Sooo, she only nurses until she can't take the pain anymore and stops but isn't file dup? I love your blog! My son is five weeks younger than your Brinley and it has been nice to see what is coming next.I have a questions about Brinley's naps. If I am reading your current schedule correctly she only takes two 30 minute naps? I am curious because my son sleeps at night from 8pm- 7am and still takes two 1:30 naps. I guess I am just wanting reassurance that I'm doing everything right, I am a first-time mom. Krysten Traylor, I can help clarify that one. The schedule says that she starts the nap sometime between 10:30 and 11:00 and then sleeps until around 1:00. Same thing for the evening nap. Yes, your son should be taking 2 naps each 1.5 hours or so. Hi there! I have been following your blog since I had my little one in Dec '12. I have a few questions that I hoped you could help me out with…1.) She is on a 4 hour feeding schedule right now…Only lasts about 2 hours awake and I don't see that 3rd nap diminishing anytime soon. Do I need to start trying to extend her? She used to sleep 7-7 at night and has now started 7-6 and naps are shorter (1.5 hours for the first two and about 2-45 min for that last one).2.) I always take her upstairs at night and give her the last bottle of the day in our chair and then put her right down. Is this something that I should try and start avoiding? I know at some point she won't be taking a bottle anymore and I am wondering if I am making things too difficult for myself down the road.3.) Do you schedule your babies' wake times? If so, what kind of activities do you do and when?